In today’s business world, quality control is a way of life at organisations. It is imperative to make this approach a part of the business process management to ensure operational efficiency. Implementing technology that aligns with the business strategy of an organisation can help drive businesses forward. Instead of using multiple resources and tools for quality control, organisations make use of Enterprise Resource Planning (ERP) software solutions to automate their business processes to ensure quality control. Organisations use ERP solutions as tools to drive a quality management culture within the organisation as they offer better business process optimisation, customer-driven quality, business intelligence, reduced data redundancy and increased employee participation. An effective ERP solution will provide operational support while offering strategic management by integrating various aspects of an organisation. Lower operational costs and reduced business risks. Customer satisfaction can become challenging when the business processes are executed on different platforms in an organisation, this can be streamlined with the integration of a technology solution that aligns with the business strategy of the organisation. ERP solutions are just that, a software that streamlines everything by simply integrating all the processes on one platform. ERP solutions help bridge these gaps and instead focus on enhancing productivity. ERP solutions are just that, a software that streamlines everything by simply integrating all the processes on one platform. Quality control in ERP systems implementation means identifying the challenges and overcoming them. It is associated with the testing process and correcting errors. It includes identifying an application and checking whether it is performing its functions properly when multiple workers are using it. It is important for an organisation to maintain the quality in order to increase revenue, reduce cost, and improve productivity. In all industry areas, maintaining high quality is a crucial factor for the success. However, quality control in the ERP system is not just about error detection and their removal. It is also associated with speeding up reporting cycles, providing new insights into numbers, and encouraging management’s confidence in performance records, budgets, and financial statements. In the past, ERP solutions were made to suit only big businesses, implementation of these solutions incurred significant investments and for small/medium sized businesses this would be a daunting task. Today, businesses of all kinds can leverage the benefits of ERP solutions, they are cost-effective and can be tailored based on the requirements of the organisation. ERP solutions have moved to the cloud today and organisations have affordable software solutions to meet their business strategy demands. Using software systems, you can ensure that your business is receiving consistent and favourable results. You can assign and track your services to make sure that everyone is working in the right way. Apart from that, you can plan your work and improve productivity in the workplace. Today, technology is everywhere, and it has changed the way we work forever. For those of us in the cleaning industry, innovations and new technology are transforming the way we deliver our services, manage our resources and promote our business. Technology that reduces your labour costs and increases your efficiency, both on the ground and in the office, will bring value to your organisation. Whether it’s a new cleaning product, software solution or piece of equipment, keeping up with the latest developments is a must if you want to get ahead. 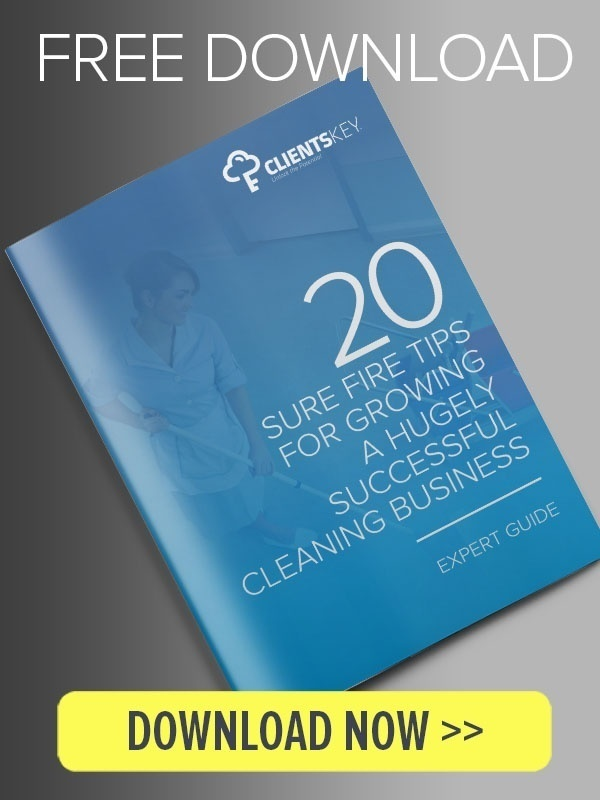 Here are four simple and effective ways leading cleaning companies are using technology to grow their business – and you can too. Direct8 has been in the cleaning industry for over 25 years. For Direct8, all clients are equally important and the company continually strives to perform as market leader in the industry. Their reputation as a quality service provider in the hospitality and commercial cleaning industry is one to be envied. With this in mind, the management team of Direct8 sought to find an activity management system like no other. Clientskey and InClean Magazine continue partnership in 2018 and beyond. The leadership team at Clientskey were in Sydney this week discussing the ongoing partnership with InClean magazine. Eric Tselios of Clientskey met with Samantha Ewart and Claire Hibbit from InClean Magazine to ensure the continued success of the ISSA expo as it rolls into NSW later this year and NZ early next year. ISSA prepares for New Zealand Cleaning & Hygiene Expo with Clientskey as key technology partner. The Australian ISSA expo allowed us to showcase a product we believe will help you work better. We loved talking to many new and prospective clients about “innovation in delivering improved performance, productivity, safety, and sustainability”. As we prepare for the next leg of the Cleaning and Hygiene Expo in New Zealand, our team is not resting on their accomplishments. The Clientskey web platform and mobile application is in continual development; testing and improving. We listen to what you need to get the job done, not just manage the paper on your desk. The Clientskey team want you to take charge of your day. Clientskey emerges as the industry leading activity-based monitoring system for all service industries. These are exciting times here at Clientskey as we welcome you to our new website. Invest in a way forward.